Options 18" x 26" x 3.75" 23" x 35" x 3.75" 29" x 45" x 3.75"
The benefits of a memory foam bed are well documented with human beds selling for thousands of dollars. The attractive cover is removable for washing. The core is ingeniously designed for genuine memory foam comfort while affording ultimate support for any size dog. While the Memory Sleeper is wonderful for pets with bone, hip or joint problems this bed is also the ultimate in comfort for any size dog. 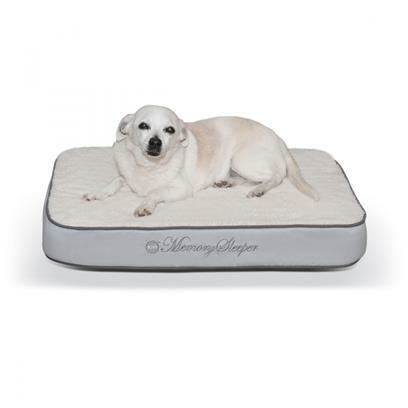 While the Memory Sleeper is wonderful for pets with bone, hip or joint problems this bed is also the ultimate in comfort for any pet. Remove the cover and wash it on the gentle cycle with cold water. Line dry or use the no-heat cycle on your dryer. So thick your pet will never ""bottom out""